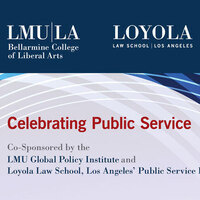 In partnership with Loyola Marymount University, Loyola Law School is launching the Loyola Public Service Institute (LPSI) with a two-day conference on February 21st (at LMU) and 22nd (at LLS). LPSI will address what it means to be a lawyer and public servant in a dynamic and ever-changing world. LPSI will convene nationally renowned lawyers who serve the public in a variety of ways, including judges, lawmakers and staffers, other elected officials, public defenders and members of law enforcement to discuss topics related to civic affairs and public life and propose solutions to specific, real-world problems. The Institute will encourage law students to pursue careers in public service by providing mentorship opportunities, externships, and jobs. LPSI will also promote Loyola’s long-standing commitment and strength in public service.